A UKIP AM accused of nepotism said she pulled a job title for her brother out of "thin-air". Michelle Brown told an employment tribunal that she did not check job descriptions before handing out work in her assembly office. Her former advisor Nigel Williams alleges he was dismissed after failing to give Ms Brown's brother Richard Blaxendale a job as a receptionist. Ms Brown disputes Mr Williams' claims and said it was a breakdown in trust. Mr Blaxendale was appointed by his sister to work as a "case worker" for six months - but failed to get a permanent position. Mr Williams told the tribunal on Thursday that Mr Blaxendale was not suitable, had no qualifications and "was not capable of doing the job". 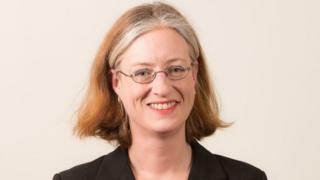 Under cross-examination from Mr Williams' solicitor on Friday, North Wales regional AM Ms Brown said she had been given job description for various roles in her office but had not read them - and then lost them. "It sounds negligent of me," she said. Ms Brown said she wanted the role of a "gofer or a dogsbody" in the office and had offered the position to her brother for an initial period of six months which was described as "case worker". "I just pulled the job title out of thin air," she said. Image caption Nigel Williams has claimed he was dismissed after failing to give Mr Blaxendale a job, which Ms Brown denies. Ms Brown was accused by Mr Williams' solicitor, when the assembly said the role needed to be advertised and made permanent, of trying to intervene to give her brother a better chance of success. The tribunal heard that she asked if the requirement of a C at GCSE could be downgraded to "desirable" rather than "essential". Nigel Williams' solicitor put it to Ms Brown that she did not care if her brother was not up to the job. "That wasn't the case," Ms Brown replied. Jodie Franklin from Welsh Assembly's Members' Business Support told the tribunal that there were issues about Mr Blaxendale's literacy skills and that he failed a typing test as part of the job interview process. Ms Brown said the main reason for Mr Williams' dismissal was a total breakdown of trust between the two. She said that she had told HR officials at the Welsh Assembly that she "wanted to get rid" of Williams. She claims that was a result of Mr Williams continuing to contact a UKIP official after she told him not to. But Ms Brown told the tribunal that officials advised her that sacking him would be difficult - and that investigating the claims against Mr Williams followed by a disciplinary process was a better course of action.